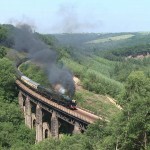 What counts as a “GWR 175” tour? There are 3 “interlopers” on this disc. 70013 deserves its place as a representative of the BR standard locos, which were common on the Western Region, and three quarters of the route on 1st May was in GW territory. 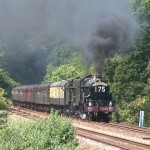 6201 was designed by Swindon-trained William Stannier, and is seen by some as the GWR pacific that Swindon never built. The Red Dragon was run over GW metals, as was most of The Britannia Banker, which also has to be included because of the part played by 9600. 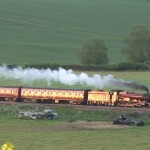 4965+5043: Tyseley-Kidderminster-Kemble-Didcot and return. Chalford; Sapperton; Bourton; Didcot Railway Centre; Knighton Crossing; Coates. 5043: Solihull-Oxford-Basingstoke-Salisbury and return. Northbrook. Fri 16th, Positioning train. 5043: Solihull-Slough. Radley; Cholsey. Sat 17th, The Bristolian. 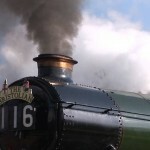 5043: Paddington-Bath-Bristol Temple Meads-Badminton-Paddington. Uffington; Shrivenham; Corston; Narroways Junction, Bristol; Westerleigh; Cholsey. Sat 18th, Positioning train. 5043: Slough-Solihull. Culham; Tackley; Clattercote. 70013: Poole-Bath-Cardiff and return. Lockerley; Stockton; Severn Tunnel Junction; Upton Scudamore. 5043: Solihull-Oxford-Didcot and return. Yarnton. 4965+5043:BristolTM-Exeter-Plymouth and return. Beam Bridge; Whiteball Tunnel (both sides); Rattery; Hemerdon (three locations); Woodrow Barton; Stoke Cannon; KillertonPark. 5972: Carnforth-Tyseley-Oxford-Southall. Tackley (2 locations); Culham. 21st May: Light engine movement – 5029: Didcot GWS-Bristol Barton Hill. Didcot; Swindon. 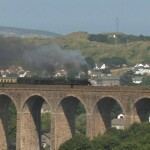 5029: Newport-Pontyclun-Felin Fran-Carmarthen, Fishguard-Felin Fran-Pontyclun-Cardiff. Llanharan; Ferryside; Spittal; Britton Ferry. 6201:Tyseley Warwick Rd-Kidderminster-Worcester-Kemble-Didcot-Kemble-Bromsgrove. 6201+9600: Bromsgrove-Saltley (reverse)-Tyseley. Sapperton; Longcot; Lickey Incline (3 locations). 5043: Solihull-Foxhall Jc. 6201: Didcot Foxhall Jc-Badminton-Swansea-Badminton-Oxford-Solihull. Radley; Rodbourne; Uffington. Sat 26th, 6024: Paddington-Newbury-Taunton. 6024+D1015: Taunton-Exeter. 5029+6024: Exeter-Plymouth-Par. Somerton; Whiteball; Dainton; Rattery; Forder; St Germans. Mon 28th, 5029+6024: Penzance-Exeter-Bristol-Swindon-Paddington. Angarrack; Chasewater; Largin; Liskeard; Hemerdon (2 locations); Combefishacre; Burlescombe (3 locations); Dauntsey; Wantage Rd. July-October is covered on Steam Age Pictures Vol. 36.